The holidays are upon us and soon we will be gearing up for the busiest time of the year. In a few weeks Thanksgiving will be here. In the meantime, we will all be planning the big meal, helping guests make lodging arrangements and possibly making travel arrangements. It can be a really stressful time and sometimes it’s easy to forget to remember what we are thankful for. It is also easy to forget about helping others. A lot of people think of giving and charity at Christmastime, but we can also show love and give thanks at Thanksgiving too. There are many ways that Christians can show love in this season of thanks giving. 1. Serve At A Homeless Shelter - Have your Thanksgiving dinner early this year and then go serve at a homeless shelter on the actual holiday for a few hours. Helping those less fortunate is good for the heart and helps put your blessings (and struggles) in perspective. 2. Take Dinner To An Elderly Neighbor - Just before you sit down for your own family dinner, take some food to an elderly neighbor who may not have family nearby or is unable to get out. 3. Help A Friend With Make Ahead Food Preparations - Get together with a good friend and do some make ahead food prep. Roast and bone both your turkeys or make your pies together. Not only will this cut down on stress on the holiday, you can also spend some quality time together. 4. Invite Someone With No Family To Dinner - If you know someone who has no family or has family that is far away and isn’t able to make it home, invite them to dinner. If you have a friend who is going through a hard time such as a divorce or financial difficulties, invite them too. 5. Buy Your Pet Some Special Food - Show your pet that you are thankful for them by getting a can of special food or some treats that they are not used to getting. Animals are our faithful companions, protectors and lap warmers. They deserve a special dinner too. 6. 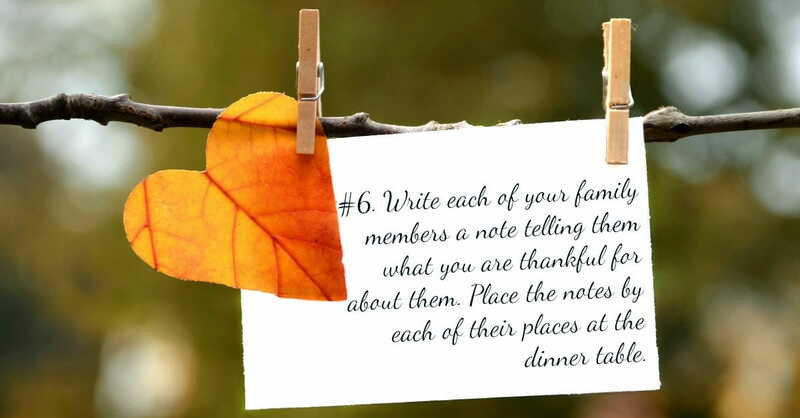 Hand Write Notes To Your Loved Ones - Write each of your family members a note telling them what you are thankful for about them. Place the notes by each of their places at the dinner table. 7. Share Your Leftovers With An Elderly Neighbor - If you are up to your eyeballs in leftovers, share some with an elderly neighbor. They will be extremely grateful. 8. Buy Someone’s Thanksgiving Dinner - If you are in a financial position to do so, buy the fixings for Thanksgiving dinner for a low income family that you know or a single Mom. If you go out for dinner on Thanksgiving, consider paying for someone else’s dinner like an elderly couple or a veteran and their family. 9. Donate To A Charity Or Food Bank - Make a donation to a local branch of a charity like the Salvation Army or to your local food bank. This can be done in a few different ways. It can be monetary, directly to the charity in person, or at your local grocery store. One of our local charities has a food drive every year by stuffing a public transportation bus with food donations. 10. Blessing Bag - Take a gallon size zip lock bag and put things in it like a toothbrush, travel size toothpaste and Antiperspirant, feminine hygiene products, bar soap, hair shampoo/conditioner and food coupons (like dollar coupons from fast food restaurants). Take them down to the poor section of your town the week before Thanksgiving and give them out to the homeless. There are many ways to show God’s love and be a blessing to others this Thanksgiving. Let your light shine and be blessed. Do you still worry about getting overwhelmed with all the ‘stuff’ that needs to be done and that you will totally forget what the holiday is really about? Let us pray. We’re coming up on a very busy time of year. I know that I can get totally lost in all the things that need to be prepared, baked, bought and wrapped. It can be so easy to forget all the things You have done for me. I pray that You will help me to keep my mind and heart open. That You will remind me to look beyond myself to see what someone else needs. Bless me with the time and/or finances to do something special. I want to light up someone’s world with Your light shining from me. Help me stay focused on the things I’m thankful for everyday, no matter how big or small. Help me stay focused and thankful on all the things You do for me as well. In Your Name I pray. Amen. Carrie Lowrance is a freelance writer and author. She has been featured on Huffington Post, She Is Fierce, and Parachute. She has also published two books of poetry and one children’s book. You can connect with her at www.freelancebylowrance.com.